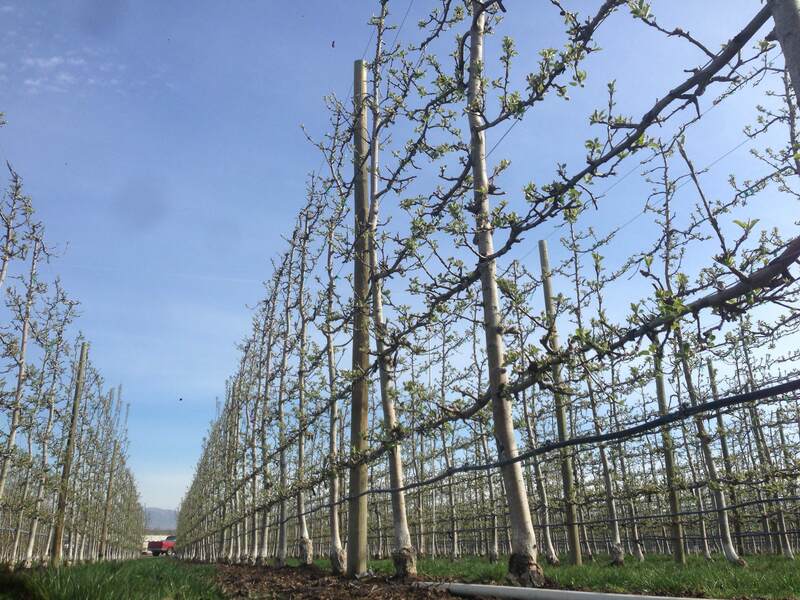 WSU Extension offers a bounty of pertinent information about orchard management on their website . They also host continuing education and I recently attended a two-day workshop focusing on Apple and Pear Physiology. The following information hit me as either useful or interesting or both. Note that different tree fruit varieties may not behave as indicated in these generalizations. Transition from vegetative bud to fruit bud could occur at different times during the season and is not tied to temperature or day light. This transition is called floral initiation. 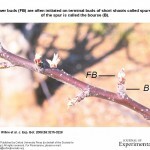 Within 120 days after this year’s flower bloomed, 95% of the new buds that are going to transition to flower buds were committed to the transition. 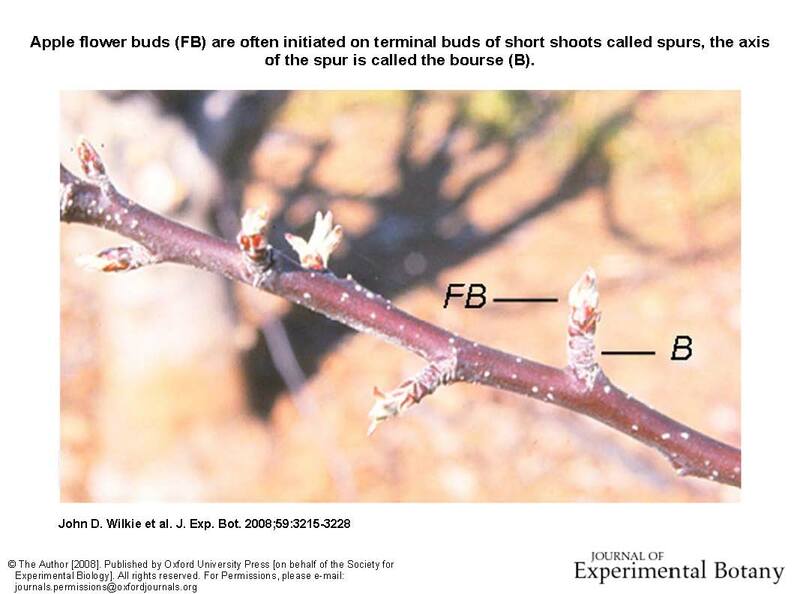 Spur buds can begin transition within a few weeks after bloom. 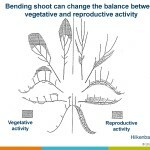 It is more likely for a vegetative bud to transition if there are at least six leaves feeding it carbohydrates and if it is exposed to at least 70% of full sun, especially during the first seven weeks after full bloom. Thinning fruit, summer pruning and bending shoots toward horizontal all foster floral initiation. 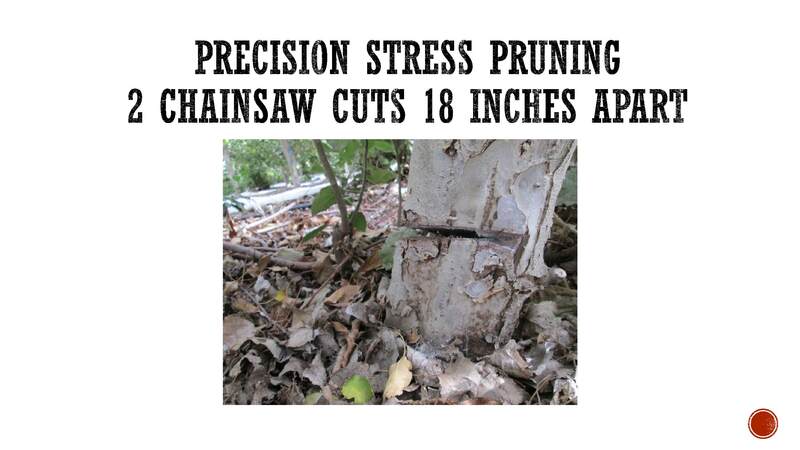 The commercial growers exploit stress to manage their trees. 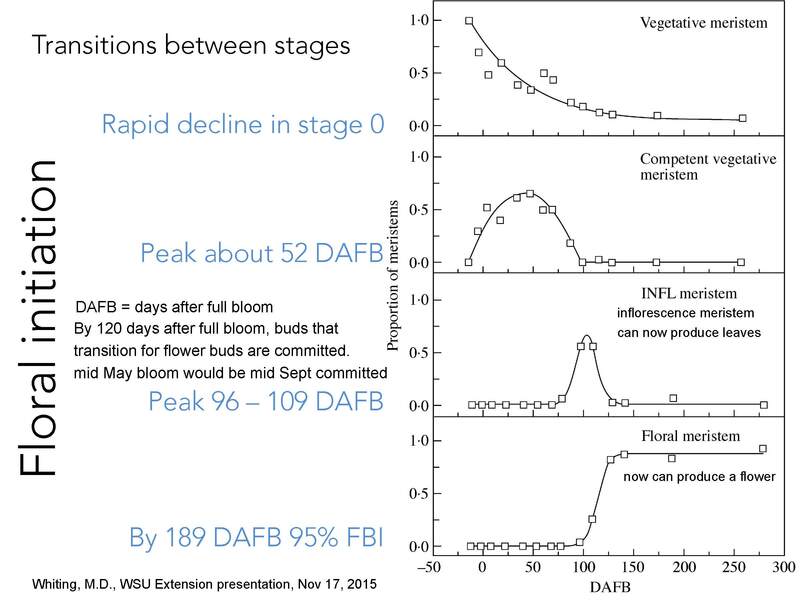 Water stress can help flower initiation by reducing vegetative growth. The last thing a commercial grower wants is a 24″ shoot. After all, they sell apples, not shoots. It was fascinating to listen to methods used, such as limiting irrigation during the growing season. Growers don’t freak out when they see leaves droop. 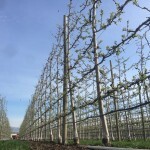 They point out that many growers water trees based on the driest area in the orchard. 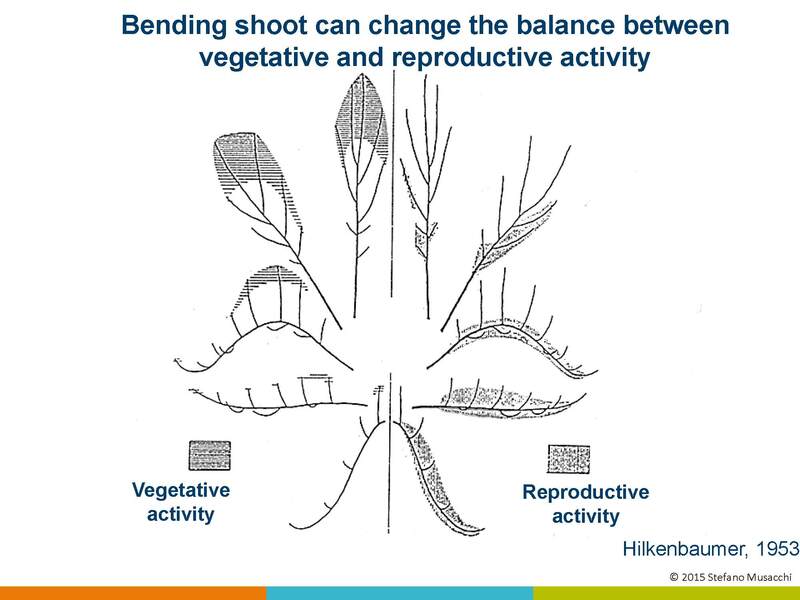 Pruning can also reduce vegetative growth. 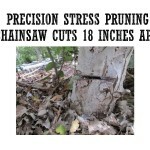 In one extreme case, a grower used a chainsaw. (picture of tree) The tree got the message. Some cultural practices reduce flower initiation, e.g. applying excess nitrogen. Also, the more vigorous the shoot, the less likely it will flower next year. And, if there was seeded fruit on the spur this year the chance that the same spur will initiate a flower bud will be greatly reduced. However, those bourse shoots, which will swell and look like a knob, can throw out new spurs in seasons to come. Be careful to only pick off the apple when you are harvesting! You can spot next year’s flower buds 120 days after petal fall, which is about mid-September for a mid-May bloom. Take a look at your tree now. Flower buds tend to be bigger but the real defining item is that the meristem (the bud region of new plant tissue) is domed, versus flat. Before the leaves fell, the tree roots sucked from them the last of the carbohydrates. These stored sugars provide the energy for spring operations, well before there are leaves to begin a new energy source via photosynthesis. Buds and roots are still growing in fall but become dormant for the winter, in order to survive. An apple tree needs to meet both a chill unit requirement and a growth unit requirement in order to wake up and break bud in the spring. You can’t shove an apple tree into the greenhouse for the winter and expect good results. Hourly temperatures after October 1 are tracked. A temperature of 43F for an hour will earn the maximum one chill unit. 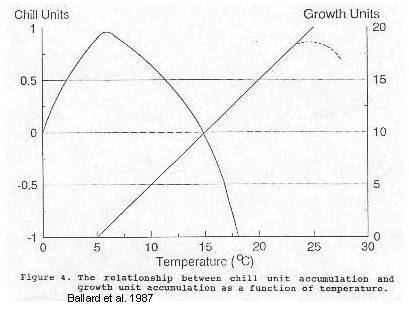 Temperatures above and below less than one chill unit (see chart). Freezing temperatures earn no chill units. Alternatively, warm temperatures, over 60F, subtract previously accumulated chill units! Delicious apples need 1,200 chill units. Growth units, also measured hourly, are earned whenever the temperature is over 41F. 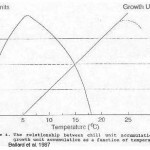 You earn a growth unit for every degree that the temperature is above 41F. Delicious apples need 7,000 growth units after October 1 to break bud. Finally, after 12 months of growth and dormancy, your floral bud is ready to flower and make fruit. Trees generally produce many times more flowers than the desirable number of fruit per tree. 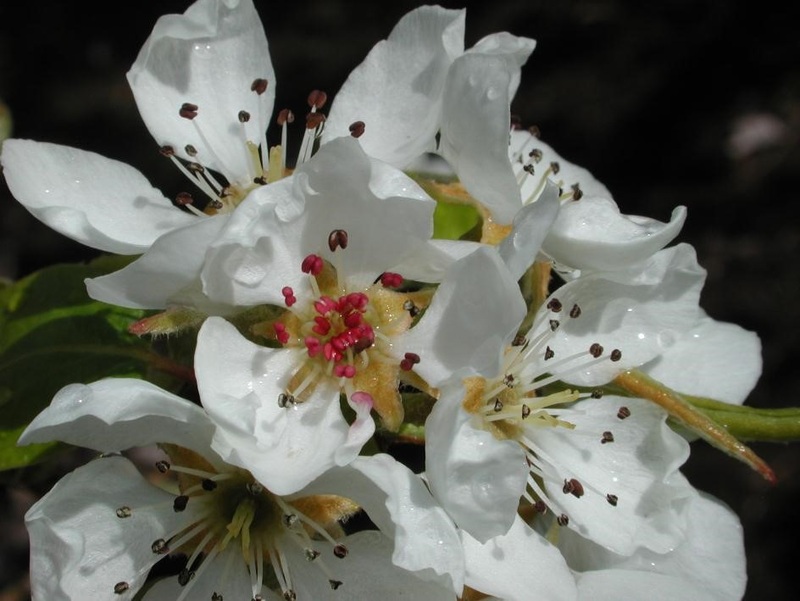 When thinning flowers, leave the king flower, the center flower, on the apple. 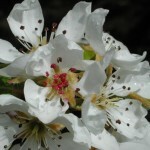 But, leave a basal flower on a pear, as it is the most developed. If thinning fruit instead of blossoms, it’s best to thin before the fruit is 11mm in diameter, the width of a pinky finger. The number of cells is big factor to determine the size of the apple. 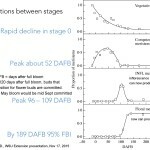 Cell division in fruit is exponential during the first 7-14 days after pollination and then continues for another 3 weeks or so, during which time, cell elongation begins. If developing fruit drops early, it’s usually due to competition with other fruit for food, nutrients and water. There is constant competition between the different energy sinks: roots, shoots, flowers, fruit and secondary growth. By fall your apple is ready and, near to where you pick it, a floral bud is working away internally to be ready for next year. This entry was posted in Plants, Uncategorized and tagged apple, bourse shoot, bud, floral initiation on November 29, 2015 by Ruth.